Annette Harcus is known for her visually elegant designs and as a strategic businesswoman. For nearly 40 years at the head of Harcus Design Pty Ltd she has created distinctive projects that are awarded internationally. Her work is seen consistently in exhibitions, Australian design annuals and journals, Graphis, Communication Arts, IDEA magazine and specialist books. Annette’s conversations can be peppered with words like calligram, roundel, prismatised and scherenschnitte (a German paper-cut artform). The Harcus timesheet allows for 24-hour days. Annette is also a promoter of design. 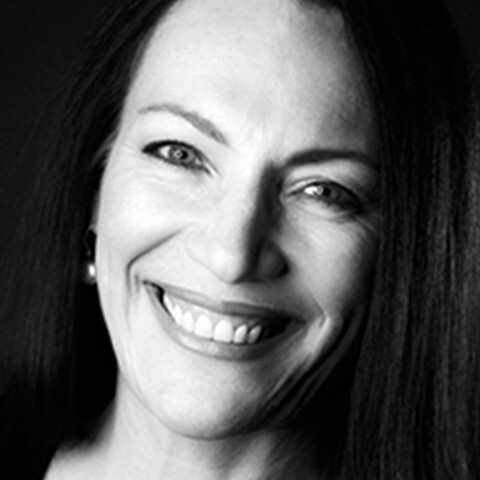 As a member of the Australian Graphic Design Association (AGDA), she has been an advocate of design to the business community, expressing the positive contribution design makes to society and the built environment. She has sat on advisory boards for the University of Technology Sydney (UTS), Western Sydney University (WSU) and TAFE, and served often as a judge for a variety of national design awards. At SCA Annette produced small commercial projects including hand-painted T-shirts. She also began an association with Kangarucci, a fashion label for whom she eventually designed and illustrated many popular posters, cards, ceramics and advertising, mostly featuring her whimsical koala character. After graduation she worked for a few weeks with Ray Bennett who specialised in a company reports – an experience that confirmed she was not a ‘document’ person; then for two years she shared a studio with her brother-in-law, Swiss-influenced David Roffey. Her early career was inspired by a creative family, and also family friends like Sharyn Storrier Lyneham, who was then designing books in London, and went on to be editor-in-chief of Australia’s Vogue Living. By 1982 Annette had the confidence to establish Harcus Design as a multi-disciplined practice with an approach to create outcomes beyond what were then traditional boundaries. One early client was John Singleton Advertising who commissioned a poster for the 1986 visit of Pope John Paul II. Annette produced a colour-pencil portrait of the Pope with a sulphur-crested cockatoo on his shoulder, surrounded by Australian flora and wildlife, all sitting within a pastel border of jumping kangaroos. It was controversial but a public hit. Annette continued to grow her fashion clientele to include Amco, Cue, Jonathan Sceats and others. Kangarucci often sent her to New York, London, Paris, Milan and Tokyo to photograph their garments and for trend spotting. Opportunities also opened up in brand, packaging, corporate and retail projects throughout Australia, Europe and Asia. Her vast retail and environmental projects, as seen in the Harbourside at Sydney’s Darling Harbour (1988), Bluewater for Lend Lease UK (1999) and with Taipei 101 (2004), are examples of deep cultural investigation and strong relationships with co-creatives and manufacturers, mostly from within Australia. In 2001 Harcus Design rebranded the ABC, Australia’s national broadcaster, with implementation across multiple platforms and divisions. With a strategy ‘to create a contemporary brand identity that referenced the ABC’s past and heralded its future’, the pre-existing flat version of the ‘Lissajous’ curve was rendered into a refreshing 3D metallic version, with custom typography. In 2012, Desktop magazine placed the ABC logo first of the top 10 Australian logos of all time. Over the last 15 years, Harcus Design has forged a reputation in luxury packaging – particularly with wine and spirits clients like Yalumba, Ninth Island and Australia’s First Families of Wine, and also in the beauty space with Maine Beach and others. These projects are admired for their contemporary use of classic motifs and their exquisite detail across brands, labels and gift boxes. As with all projects, Annette is deeply involved in creative direction, typography and image, always with respect for craft and history. Annette is pleased to have guided her studio through several difficult downturns in the economy and built partnerships through designer-client liaison; many clients have worked with Annette for 10, 20, even 30 years. She is like family to clients and clients become like family to her. She feels most fortunate to mentor designers, particularly young women, who after some years in the studio, have gone on to establish their own businesses. Content for this article has been extracted from interviews, articles and other sources. Annette Harcus portrait: Brendan Read.